LSiM 707 upgrade from RTi A7? Hi guys, Best Buy in Canada is offering the LSiM at a very attractive price so it got me tempted to buy a pair to upgrade over my current set up. I don't see any sales at all for matching surrounds nor the center speaker (also don't really have that much money to upgrade all at once). My question is, if I only switch out my RTiA7 out for the LSiM 707 for now, while leaving all my other pieces in tact, would my sound still be acceptable or will everything be really off on movies because they don't timbre match? Would love all advice and help from all you experts! I would strongly recommend getting either the 704 or 706 for a center channel speaker with the 707s. I use a 704 because I could not get my 706 to fit in my system but don't notice much of a difference between the two really. The rest of the speakers don't matter as much. Thanks for your input! I did not look into the 704's before, I was only looking at 706 originally. The 706 pricing and size was a concern for me, these 704's could really save me on both of those issues. Really appreciate it! The center channel not timbre matching the front two may not bother you personally. On the other hand it may irritate the crap out of you. Some people don’t notice or prefer an unmatched center. I’ve heard people say it enhances the dialogue. My personal vote is buy the 707’s, and if the center channel not matching bothers you, simply box the 707’s back up and wait for the 704 or 706 goes on sale. Incidently that 706 is a big speaker. I needed to get a 70 inch stand to fit a full size component on each side of it. I am not close to being an expert, I can regurgitate what I have read on these forums in the past. The 707's are big & need power. Room size is often referenced, need big space to appreciate them. If the deal at BB is very good, tough to say no, 705's appear more rounded, you are not seeing the rampant US discounts on all the Polks we see, 707's maybe a lot of speaker for your set up. 2 cents..
2C: Parasound A21, Cambridge 851N, Polk LSiM705's. I know I'm sounding like a broken record but I always preferred the 705 until I heard the 707 on my T+A amp. It didnt pair well with the 703, but on the 707 it took those speakers as far as they are capable of without modifications. The sound was stunning and could easily be an end of the road sound for anyone. Regarding replacing the RTi, with enough power I do think it would be an upgrade worth pursuing. In the same vein you might be able to find some Usher speakers up north and those are dynamic, smoother than the RTi, easier to power, and have more potential in sound quality over the LSiM series (again, without mods in the picture). They should fall in the same price range as the 707 especially if used. Thanks for everyone's input! Best Buy Canada has them for $1k cdn ($740 USD) each, hence making me extremely tempted. Would it be safe to assume that if my current set up sufficiently powers the RTiA7, it should likely be enough to power the LSiM707 or are they even more power hungry? The LSIM are more power hungry than the RTi series. Although power ratings are similar on the two speakers, sensitivity is lower on the LSIM, so they will not play at the same “loudness” level with the same power as the RTi. I pulled the trigger on a pair of those 707’s from Best Buy as well. My intention is to use them for a 2 channel music set up that I am putting together. I have RtiA9’s for HT and will be curious to see how the 707’s perform with everything when I get them and swap them in to ensure they work. Of course, when new and no hours on them it’s probably not a great comparison. OP, I’ll post something up though as I have the CsiA6 as well and am curious about the difference without being timbre matched. what's the rest of your system? Would love to hear your findings once you test things out! Please let me know, thanks! 7.1 - polk RTi10 x 3 (LCR) : FXi3 x 2 : RTi4 x 4 : Sunfire SDS-12 : Yamaha Aventage RX-A2040 : Adcom GFA-7500 : Squeezebox Touch : DIRECTV : Roku SE : Panasonic PT-AX200U PJ @ 120"
sorry, i lost it in all the speakers. I think my first question would be what is your ratio of music to movies listening. If it leans towards movies, then the LSiM may not suit you as well as the RTi. The LSiM while versatile is considered a "musicality" speaker by comparison. I agree. More towards movies, I'd upgrade the amp. Currently, I would say my use is 50% blu-ray movies + 40% Sports/TV/Netflix + 10% music. The only reason I don't use it much for music though is because I find the sound quite lacking. I originally thought these speakers could potentially keep the movie watching experience while enhancing music, but would I be losing out on my movie watching experience? How do the RTi lack in terms of music? They shouldn't sound so bad as to dissuade music listening to the point where you are basically avoiding it. I'm not going to say that the LSiM would result in losing out per se. It's just that it's not unusual to hear to people say that they prefer the RTi for movies. I've heard the LSiM play movies, and they didn't have that big special effects sound that brighter speakers like Klipsch and the RTi have. But for music listening IMO they are superb. I've heard them play audiophile tracks through SACD in a living room and honestly I personally could not detect imperfection at all. I think that was their calling. But, if I had a dedicated HT set-up, they would not be my first choice. This guy does a direct comparison between the speakers in question, and pretty much sums up what I've said. But, again, if your RTi really sound that bad for music, then there is something else amiss like maybe with your arrangement / environment. My RTi system sounds ok for music. Not amazing, not awful. It took some experimenting with different gear to get it to this point. It crushes HT, though. Finally watched Solo last night and it sounded great. I think you guys have successfully convinced me not to get the speakers and to look at a more powerful power amp instead to juice up my current RTiA7s. Thanks for all your input! Agree100% on your assessment of the Rti line. I really enjoy my gear for HT and I feel it really shines for this use. I am looking forward to the 707’s for SACD’s, CD’s and all things musical. All I need then is a proper smoking jacket, a cool smoking pipe, a super comfortable soft leather lounging chair and some nice cognac to sip. I have all those things available for purchase. Of course, I only accept cash. I went from RTi8 to Signature S60. I found the RTi a step better on movies. For Music the S60 are way better. Does BB up there have the same return policy as we do? If so but them, try them out and if you don't like them take it back. Glad you have joined the 707 club. I wouldn’t say I’m in the club but it did give me new appreciation for them. I still prefer similarly priced Usher speakers honestly - even at the LSiM slashed prices. I can’t believe they are now $1600 a pair! Hard to find good alternatives at that price point which is an all around good performer. Someone at HQ must have ears on replacements. I hope LSiM isn’t the last in their line of flagships dumping them to focus on sound bars. Hey guys, let's say I decide to splurge a little and do get a pair of LSiM707 + LSiM706c. Will I be okay for now to just leave my surrounds as RTiA1 + T300? 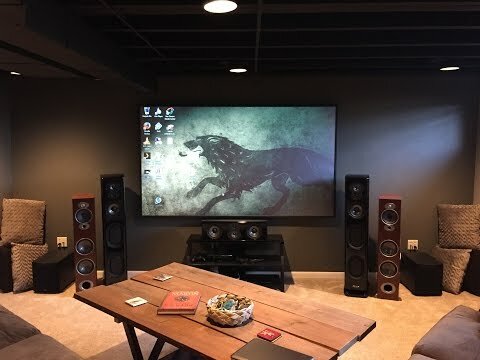 And if I were to add a power amp to give the speakers more juice, would the Emotiva XPA-3 Gen 3 or XPA-2 Gen 3 be good options for my setup, letting my AVR handle the rest of the speakers. I notice Emotiva actually ships free to Canada as well which is extremely rare. I also see a used XPA-3 Gen 1 on Kijiji in my area for a decent price, should I consider those or would a Gen 1 vs Gen 3 be a big difference? Mismatched surrounds aren't of concern to many HT folks. Emotiva gets a mixed reaction here, but I don't think it would be bad matched with LSiM for HT. Thanks for the insight! In that case, would the XPA-2 be enough or should I not cheap out and get the 3-channel XPA-3? Would it even make much of a difference? Don't cheap out! The three front speakers are the most important ones, get a 3 channel amp.